Even teachers that feel they are a YouTube-savvy (as I do about myself) should read "50 Ways to Use YouTube in the Classroom". The structure of the book takes you from 'beginner to ninja'. It can be read in small chunks for those seeking a slow pace, or you can bounce around for those looking to get better at certain aspects of YouTube. Something we can all benefit from is the many, many examples of how YouTube can be leveraged to enhance student learning, student voice, and communication. Patrick Green's writing style, while witty and humourous, is an honest assessment of what YouTube can do and challenges educators may experience, depending on their teaching context. To this, Green provides plausible solutions to those challenges along with sound advice on a variety of areas such as student motivation, parental understanding, and copyright infringement. I found myself taking notes on what I would do to improve my YouTube channels and use of YouTube with my students. "50 Ways to Use YouTube in the Classroom" includes screenshots and web links via QR codes, providing increased understanding of the topics in the book. Additionally, Green has developed a series of YouTube tutorials to accompany the book. The book has a logical flow, beginning with YouTube and general benefits of having video in the classroom, such as showing an experiment you can’t do yourself, or visiting a place too far away. He guides us through simple things that many of us don’t yet do as a habit, such as using playlists for our classes and subscribing to the best channels. Moreover, Green explains how we can find the “good stuff” using filters. He shows us how to curate videos in a way that is logical for us and our students (something I am doing more diligently since reading the book). Playlists can support differentiation as well, by creating specialize playlists. Ever thought of that? I didn’t. He discusses using defaults built in YouTube, as well as other features such as the closed captioning/subtitles and speeds. Green continues on with other classroom applications such as embedding in Forms and Slides to flip our classroom. How about making photo slideshows of your students in action? How about recording your lesson explanation on YouTube to make life easy on your substitute (and be sure that the lesson gets explained how you intended)? Perhaps needless to say, privacy is an important part of the book. If you really want to get deep into YouTube, Green touches on how to setup your channel with Channel Art, a channel trailer, and other settings (like a custom URL). Green explains how to use Creator Studio to help you get the most out of your channel, for those who want to be more serious about managing videos and reaching out to an audience beyond your classroom. YouTube Live and recording/editing with mobile apps. 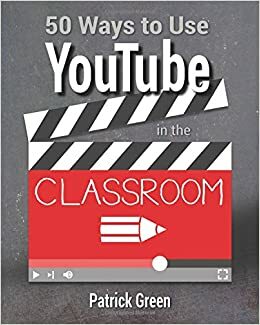 This is an extremely useful book for classroom teachers, and I would argue school administrators seeking to improve their school's use of YouTube. I thought I was a YouTube ninja before I read this book. I stand corrected!